There are a number of ways to classify gene mutations. Some classification schemes are based on the nature of the phenotypic effect—whether the mutation alters the amino acid sequence of the protein and, if so, how. Other schemes are based on the causative agent of the mutation, and still others focus on the molecular nature of the defect. The most appropriate scheme depends on the reason for studying the mutation. Here, we will categorize mutations primarily on the basis of their molecular nature, but we will also encounter some terms that relate the causes and the phenotypic effects of mutations. Base substitutions The simplest type of gene mutation is a base substitution, the alternation of a single nucleotide in the DNA (Figure 17.3a). Because of the complementary nature of the two DNA strands (see Figure 10.14), when the base of one nucleotide is altered, the base of the corresponding nucleotide on the opposite strand also will be altered in the next round of replication. A base substitution therefore usually leads to a base-pair substitution. Base substitutions are of two types. In a transition, a purine is replaced by a different purine or, alternatively, a pyrimidine is replaced by a different pyrimidine (Figure 17.4). 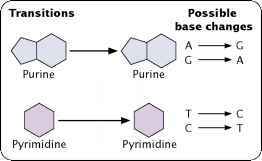 In a transversion, a purine is replaced by a pyrimidine or a pyrimidine is replaced by a purine. The number of possible transversions (see Figure 17.4) is twice the number of possible transitions, but transitions usually arise more frequently. 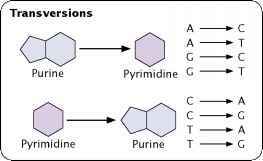 17.4 A transition is the substitution of a purine for a purine or a pyrimidine for a pyrimidine; a transversion is the substitution of a pyrimidine for a purine or a purine for a pyrimidine. sequences that encode proteins may lead to frameshift mutations, changes in the reading frame (see p. 000 in Chapter 15) of the gene. The initiation codon in mRNA sets the reading frame: after the initiation codon, other codons are read as successive nonoverlapping groups of three nu-cleotides. The addition or deletion of a nucleotide usually changes the reading frame, altering all amino acids encoded by codons following the mutation (see Figure 17.3b and c). 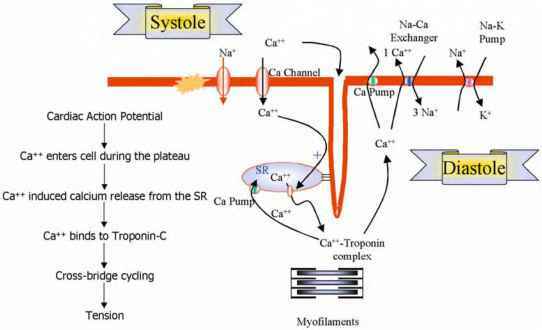 Many amino acids can be affected; so frameshift mutations generally have drastic effects on the phenotype. Not all insertions and deletions lead to frameshifts, however; because codons consist of three nucleotides, insertions and deletions consisting of any multiple of three nucleotides will leave the reading frame intact, although the addition or removal of one or more amino acids may still affect the phenotype. These mutations are called in-frame insertions and deletions, respectively.